Jane Eyre: The Graphic Novel (Classical Comics: Original Text) (Paperback) | Let's Play Books! 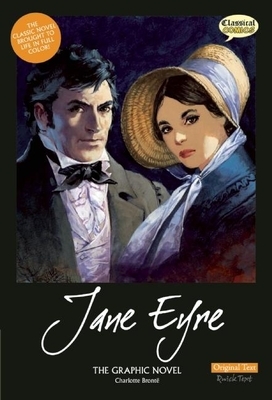 Jane Eyre is a plain, determined and intelligent child. Orphaned and poor, she is adopted by her Aunt and Uncle Reed. The death of Uncle Reed allows her unpleasant aunt to send her away to a grim charity school, where she continues her harsh upbringing, but is given the education that finally frees her. Once old enough, she becomes a teacher and takes the role of governess in a large manor house, where she falls in love with her employer. But Rochester is hiding a secret that, when revealed, forces Jane to choose between following her head and her heart. Both critically acclaimed and immensely popular, Jane Eyre dealt with concepts of class discrimination, morality, equality for women, and freedom of choice. Designed to encourage readers to enjoy classical literature, Jane Eyre The Graphic Novel stays true to Bronte's original vision. The book includes 125 pages of story artwork (by the legendary comic book artist, John M. Burns) and fascinating support material detailing the life of Charlotte Bronte.